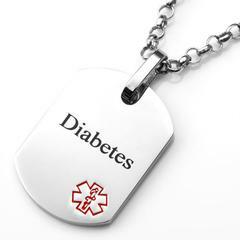 Our pre-engraved Diabetes medical id alert pendant works well for all ages. It has a high polished and is laser pre-engraved with Diabetes. Diabetes medical id alert pendant measures 1" inch in legth and 3/4" in width and comes with a 30 inch stainless steel bead chain, which you can easily cut to your size.This can be engraved with up to 4 lines of black laserl engraving engraving on the back at no additional charge! Made of hypoallergenic and non-corrosive 316L surgical stainless steel!